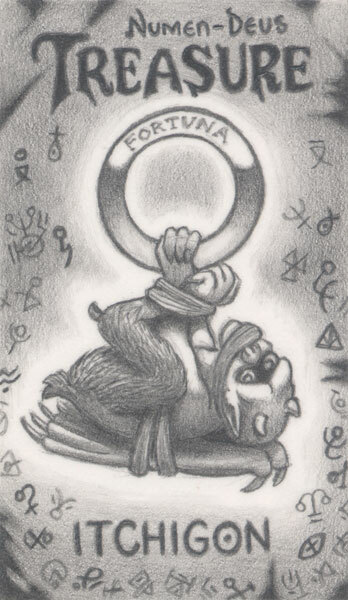 For his crimes against her, Itchigon was damned by the goddess Fortuna to remain as an amulet to ward off all other curses and misfortune. Those who possess it will have nothing but incredible good luck, but others will begin to notice this after a while and regard you with envy and suspicion. You may even become lazy with your luck, for how can you appreciate good fortune if you never have any bad? My partner has just found this exact one in a phone box number 17/20 prints signed by hermit and is also laminated what is this exactly and should I have it in my house ? It's a print of the artwork you see above, I've been printing out various works of mine and placing them around town, and have been doing for some months now. They seem to be being taken by those that see them. Although, the ones in the phoneboxes tend to be there a while. Probably due to not many people using them these days. The ones I put in the bus shelters tend to be taken more quickly. And I'll probably do more prints of other works of mine in the new year. It's quite funny that you wouldn't want it in your house, though. It's just a print of an artwork, it's not going to hurt you.